Bel Air, Maryland Auto Accident Lawyer David Batzer serves those injured in auto accidents, trucking accidents and motorcycle accident in Harford County, Maryland and Cecil County, Maryland. He also serves those with disabilities, and filing their SSI/SSDI claims, in Central Maryland and parts of Maryland’s Eastern Shore. Our Maryland personal injury practice is limited exclusively to auto accidents, personal injury, premises liability, trucking accidents, wrongful death and Social Security & Disability claims. If you have been injured in a motor vehicle accident in the Annapolis, Bel Air or Elkton, Maryland area call Bel Air MD Personal Injury Lawyer David Batzer. Harford County Personal Injury Attorney David Batzer provides is impeccable as he personally with clients to hear their concerns and answer their questions. He focuses his practice exclusively on accident, injury and wrongful death claims to better serve his clients against insurance companies, employers, and the Social Security administration. Let him put his many years of accident and injury litigation to work for you. He serves all of Maryland including Cecil County, Anne Arundel County, Harford County, Montgomery County, Prince George’s County, Frederick County, Wicomico County, Worcester County, Carroll County, Calvert County, Howard County, Washington County, Talbot County, Baltimore County and Caroline County, Maryand. If you have been the victim of any type of auto accident in Maryland, whether it was a car accident, bus accident, trucking accident or motorcycle accident, you may qualify for benefits and financial compensation. You need the help of a skilled Maryland auto accident attorney as they will handle all aspects of your claim and get you the maximum amount of compensation for your injuries, medical expenses, lost wages, physical pain and emotional suffering. Contact Joppatowne Auto Accident Lawyer Dave Batzer today for a free consult. In 2013 there were more than 23,000 workers’ comp claims filed in Maryland. A percentage of them were filed by those injured at work in Cecil County and Harford County, Maryland. Elkton Workers’ Comp Lawyer David Batzer has many years experience handling workers’ compensation cases on behalf of injured workers throughout Maryland. Let him put his experience to work for you and get you the benefits and compensation you deserve if you have been injured on the job in the Aberdeen, Bel Air, Elkton or Havre De Grace, Maryland areas. Under current Maryland workers compensation laws those hurt while at work may be able to obtain benefits and monetary compensation. The benefits that can be obtained are directly related to your case, the injuries sustained and the impact they have on your ability to work going forward. These benefits are disability (including permanent, temporary, partial and total), medical benefits, lost wage benefits, vocational rehabilitation benefits, death, funeral and survival benefits. Filing a workers’ compensation claim is a very complicated legal procedure. It should only be handled by an experienced workers’ compensation attorney as even the slightest error can result in your claim being denied. Rather than make yourself vulnerable by filing the claim yourself enlist the help of a skilled Harford County, Maryland workers’ compensation attorney. Maryland, like most states, have very strict and very specific laws pertaining to dog bites and other types of animal attacks. If you, or your child, are attacked, bitten, maimed or mauled by any type of dog in Maryland you may be able to seek legal recourse via filing a personal injury lawsuit. Each Maryland dog bite case is different as factors such as who owned the dog, where the attack took place and the events leading up to the attack all play a role in your case and establishing liability. As these cases are very complex having an experienced Bel Air dog bite attorney in your corner is a wise move. In addition to accident claims such as auto accident and workplace injury claims Maryland Injury Lawyer David Batzer also handles personal injury claims. He has many years experience successfully obtaining benefits and financial compensation for clients with physical injuries such as broken bones, brain injuries, spinal cord injuries, head injuries, neck injuries such as whiplash and back injuries including strains and disc injuries. In addition, he also handles injury claims related to Complex Regional Pain Syndrome and Post Traumatic Stress Disorder. Please contact Mr. Batzer today to discuss your personal injury case free of charge. As your legal counsel Bel AIr Injury Attorney David Batzer will let nothing stand in the way of you getting the maximum amount of benefits and compensation for your injuries, lost wages, medical expenses and other compensable issues related to your accident. Maryland law allows for various benefits to be awarded in personal injury cases in Maryland. This includes car accidents, motorcycle accidents, trucking accidents, slip and fall accidents and animal attacks. Depending on the exact circumstances surrounding your accident you may be entitled to pain and suffering compensation, lost wage compensation, medical expense reimbursement and, in the event of death, funeral benefits as well as survival benefits can possibly be obtained. All car, commercial vehicle, government service vehicle, motorcycle and tractor trailer accident cases are different in that each has different circumstances and each has different liable parties. As your attorney, Mr. Batzer will do everything necessary to establish any and all liable parties and make them responsible in court. Possible liable parties may include: the liable parties insurance company, municipalities, management companies, your employer, the other persons employer and manufacturers. With Elkton MD Car Accident Lawyer David Batzer in your corner you can rest assured that all liable parties will be identified and that you get all possible sources of compensation for your injuries. Workplace accidents that result in injuries have a different process for establishing fault. Per Maryland workers’ compensation laws if an employee was injured in the workplace, even if it was a random accident such as a slip and fall accident, the employer is at fault and the employee has the right to file a workers’ compensation claim. 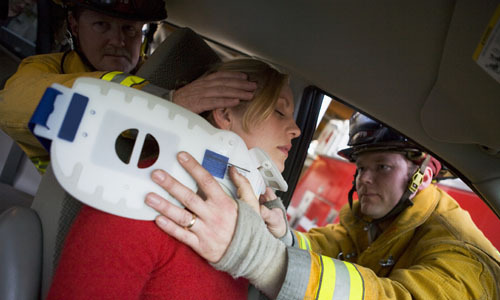 Immediately after your accident you should seek appropriate medical care. If you can, take photographs of the accident scene, get names and numbers of witnesses and call the police to ensure that a police report is filed. Taking appropriate action, or having others do it on your behalf, can help your case as it evolves. The liable parties insurance carrier will begin to protect themselves legally. You should do the same by contacting an experienced Bel Air MD personal injury lawyer regarding your case serving the Elkton, Bel Air, Edgewood, Aberdeen and Havre De Grace, Maryland areas. One thing you should not do is have any direct contact with the liable parties insurance carrier. They may very well approach you shortly after the accident regarding a quick, lump sum settlement. Do not accept their offer as it benefits them and not you. Accepting their offer can actually hurt you later on. Insurance companies have teams of car accident lawyers who know their competition. They know which attorneys are unwilling or unable to go to trial and who will, therefore, seek to settle the client’s case, often for an amount far below the fair value. Cecil County Auto Accident Attorney David Batzer can and will take your personal injury case to trial if a fair and just settlement cannot be agreed upon. Insurance companies recognize Mr. Batzer as a seasoned Maryland Trial Attorney. While we often settle our cases before trial, we can negotiate for a higher settlement amount based on the real possibility that we will take the matter to court. Insurance companies, and the adjusters that work for them, are very savvy. A common occurrence in Maryland personal injury cases is the insurance company seeking you out on social media pages such as Facebook. They will monitor your page, and in some cases ‘friend’ you. From there they are out to make sure you are as injured as you claim to be. With this in mind it is never a smart move to post anything to social media that can negatively your personal injury case. If you have any questions about what is appropriate and what is not please contact Elkton Maryland Personal Injury Attorney David Batzer for sound legal guidance. If you have been injured due to the carelessness of another in Maryland you should begin to protect yourself from a legal standpoint right away. This can be accomplished by having a personal injury act on your behalf and deal directly with the insurance carriers and make sure you get any and all benefits you are entitled to. For most people, cost is a big concern. If you have a serious spinal cord injury or are disabled and unable to work, you might wonder how you will pay doctor’s bills and lawyer’s fees. At the Law Offices of David Batzer, P.A., we operate on a contingency fee basis. We pay all initial costs and investigate your claim at our own expense. You are not responsible for initial costs, expenses, or legal fees unless we win. From his office in Bel Air, Maryland Harford County, Maryland Injury Attorney Dave Batzer serves the injured in all types of accidents in all of Maryland. This includes, but not limited to areas such as Annapolis, Glen Burnie, Towson, Essex, Upper Marlboro, Frederick, Rockville, Silver Spring, Wheaton, Landover, Bowie, College Park, Easton, Gaithersburg, Salisbury, Hagerstown, Denton, Ocean City, Bel Air, Aberdeen, Edgewood, Joppa, Havre De Grace, Churchville, Perryville and Elkton, Maryland. The Law Offices of David Batzer, P.A.